So what’s up in the veg plot? Well, things have been a bit of a struggle recently. Last month my update had pictures of some healthy veg seedlings and a nice polyculture of salad burnet, strawberries and calendula. Since then, it feels like we’ve been invaded by pigeons, starlings and rabbits. The pak choi was stripped of its leaves (despite being protected under wire mesh). The sweetcorn, lettuce and mangetout have been pretty much grazed to the ground. All that’s left of the fennel and dahlias planted out to pretty up the veg plot are a few tragic- looking stalks. And that polyculture salad burnet? All but eaten. So – it’s been a good reminder that veg growing is a constant round of ups and downs. I don’t like to think of it as a battle against nature – the birds are just doing their thing, and I don’t want to spend my time in the garden feeling embattled. But I have to admit, the last few weeks have been a bit disheartening! 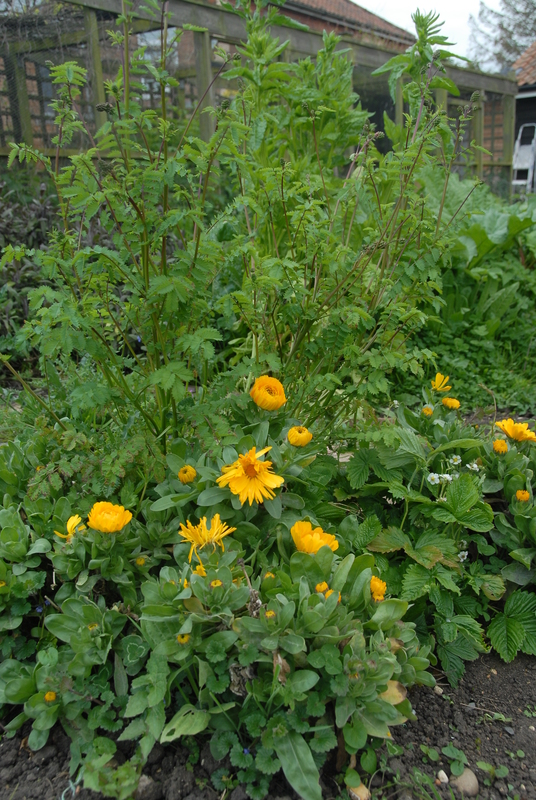 The tall salad burnet at the back of the calendula has been eaten by pigeons – grrrr! Rabbit pie is the answer. Rabbits are a real pest. Bad luck. Rabbit pie is a good answer. Try mounding compost up around the base of your thyme. It is said to help new root growth on straggly thyme stems. I do this with my older thymes. But, thank goodness, I never had a pigeon sit on one. Those wood pigeons are big! Shame about the salad burnet – such a lovely herb. Glad to know it’s not just me!! I think actually I’ve just been lucky before with the pigeons. I bought myself lots of netting this weekend, and the kids have been helping me drape it over everything that’s left! Slugs on rhubarb – never seen that – I wonder if it’s the very wet weather? But then, since rhubarb leaves are poisonous, maybe that will sort out at least a few slugs…?! Hope the acid in the leaves does the trick and hope you netting works for you! Sorry you lost so much of your crops. Right now I’ve got flea beetles, Mexican bean beetles and at least one gopher attacking my garden but I’ve planted such a variety of things I should end up with something to show for it. Thank you – at least I don’t have to worry about gophers! And a great reminder that variety works well – some things always do well, it seems! What a shame… it’s always so disheartening to lose plants when you’ve raised them so carefully. If only the pigeons and rabbits would learn to share! Thank you! Feeling better today after netting some of the veg this weekend! Corn does seem to be the Great Tempter for critters, doesn’t it? Can’t blame them, it does taste good…Hope all’s well with your plot! Bugger! Nothing worse than loosing your hard work to birds, insects and other wildlife. Hope this month is better for you. Thanks again for the well wishes, Isla is my best watering companion. Thank you! I think I was being a bit lax with netting things, to be honest…Seeds pop up so quickly at this time of year, hopefully some things will catch up if I re-plant them. Ah, nothing nicer than pottering in the veg garden with a small helper – hope you have a lovely month with your new companion. It’ s the slugs and snails which are the main problem in my veg plot. There are so many this year, Have you any tips for dealing with them? I think I’m really lucky with slugs and snails – I do sometimes find toads in the veg plot, so maybe that is the answer! I have no great slug wisdom, I’m afraid. I have in the past used beer traps (one way is to get a plastic bottle, cut an opening in it a couple of inches off the ground and fill with beer – I like this more than an empty yoghurt pot buried in the ground, as the gunge is contained in the bottle and can just be poured on the compost heap). Also, a night-time visit to pluck them off the plants with chopsticks is grim but effective. I’ve never tried nematodes – have you had any luck with those, I believe they’re expensive but quite effective? I’ve had similar problems with animals getting my plants/seeds. Whether it’s been mice, pigeons, or slugs, they’ve wreaked havoc on some crops. At least there is time to resow in most cases. I hope you are having a better month in the garden and things have all settled down for you.